Spoiler alert on the new Antioch mosaics! So, since a few days I see many friends posting the great photos of Turkish and International news agencies from a mosaic decorated floor from the recent excavations in Antioch. As far can one see from the pics, there are a couple of misconceptions regarding the mosaic. First of all the dating. 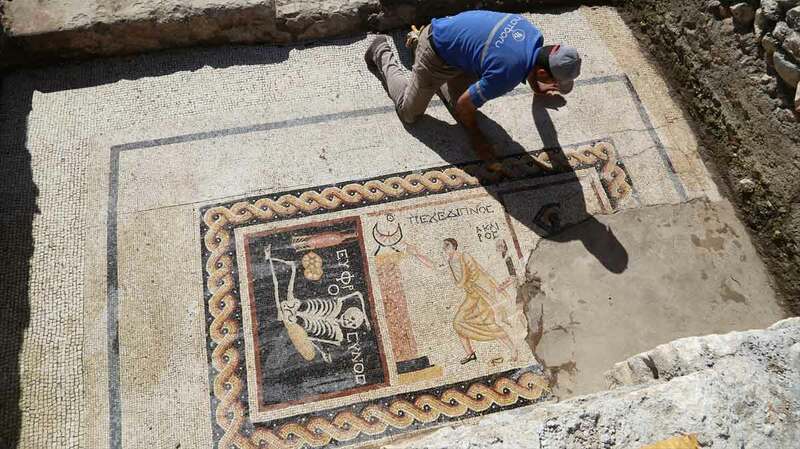 According to the newspaper they are dated in the 3rd c. BC, this seems highly unlikely for a number of reasons: the style, the arrangement, the execution of the mosaic. Their general disposition looks much more like something made in the Late Roman period, somewhere maybe between the 2nd and the 4th c. AD, and personally I would go for the latest possible dating. The strongest historical argument for such a dating is the main human form in the middle frame. There we see a man dressed in a long tunic showing with his hand a sundial (clock) erected unto a column. This person is identified by an inscription with the name ΤΡΕΧΕΔΙΠΝΟΣ. This in Greek actually means "the person who runs to dinner". This adjective is known in Roman times, but as a name of an individual is probably a literary creation of a 2nd/3rd c. AD. The Late Roman poet and philosopher, Alciphron in one of his letters describes a person Τρεχέδειπνος plotting to move the dials of the clock forward in order for dinner time to come earlier. 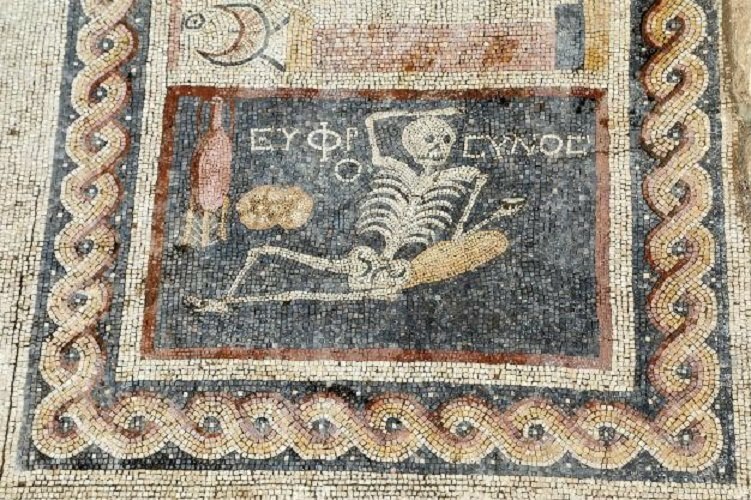 Exactly the same as in the Antioch mosaic, thus pointing to the mosaic postdating Alciphron. This also gives another meaning, I believe, to the whole composition, more of an ironic or satirical nature. 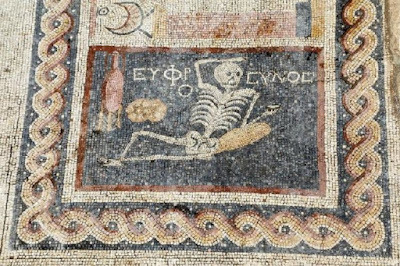 The stunning mosaic frame of the reclining skeleton figure named Ο ΕΥΦΡΟΣΥΝΟΣ (the one who enjoys life), laying between a wine amphora and loafs of bread, might again hold a certain ironic meaning: life being enjoyed by a dead person. 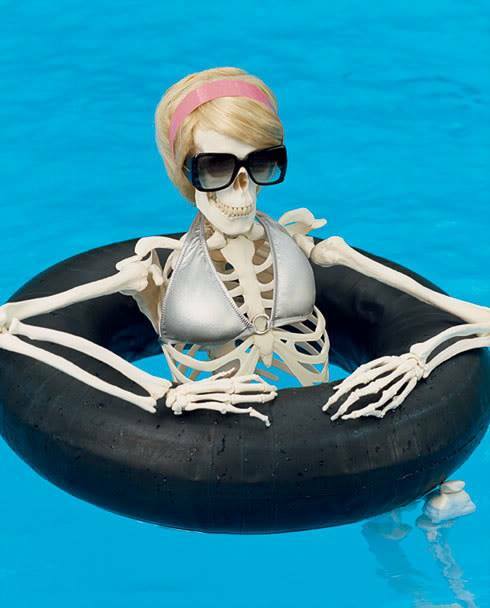 So although we, with our modern eyes, would like to see a cool picture of a dude skeleton laid back and only missing the sunglasses of the usual modern internet iconography, maybe we are losing some of the meaning. Really loved this interpretation which seems very plausible as I thought there was some irony or story intended, maybe a bit like a comic strip. Thank you!